One key ingredient to successful recovery from alcohol or drug addiction is the development of a healthy lifestyle. Treatment and rehabilitation professionals generally agree that mere abstinence alone is not enough to maintain lasting recovery. For example, the Substance Abuse and Mental Health Services Administration's (SAMHSA) working definition of recovery includes health and wellness as key components. The definition describes recovery as "a process of change through which individuals improve their health and wellness, live a self-directed life, and strive to reach their full potential." Likewise, another definition of recovery developed by a panel assembled by the Betty Ford Clinic also mentions health as an important aspect of successful recovery. The Betty Ford definition describes recovery as "a voluntarily maintained lifestyle characterized by sobriety, personal health, and citizenship." Unfortunately, one of the stumbling blocks for many recovering alcoholics in developing a healthy lifestyle is the fact that most of them still use tobacco. 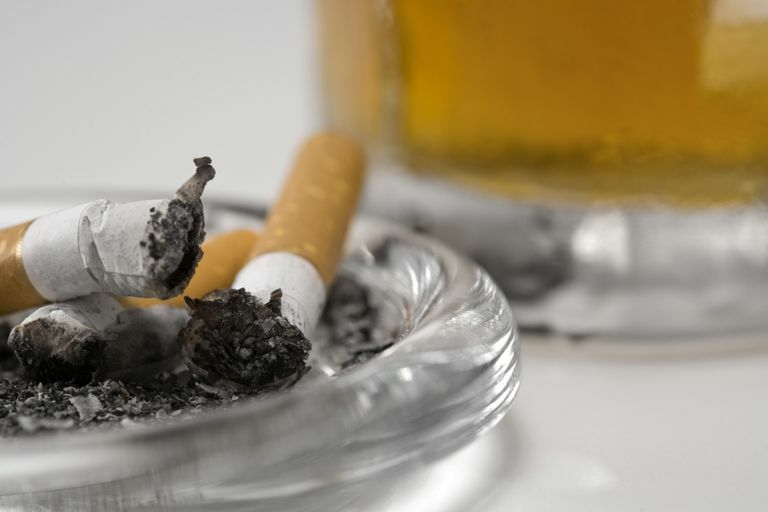 According to the National Institute on Alcohol Abuse and Alcoholism, an estimated 80 to 95 percent of alcoholics smoke cigarettes, and 70 percent of them are heavy smokers. Even among recovering alcoholics, an estimated 85 percent still smoke, more than three times the percentage of smokers in the general population. For many years, alcoholics were not encouraged to quit drinking and smoking at the same time. It was thought that the stress of quitting alcohol was enough to deal with without the added stress of trying to stop smoking at the same time. In the book Alcoholics Anonymous, in the chapter "The Family Afterward," members and their families are encouraged not to be concerned about the alcoholic's use of caffeine or tobacco, but instead, focus on the "more serious ailment" of alcoholism. We know more about the dangers of tobacco now than we did when the "Big Book" was written in 1935. Scientists now know that there is a long list of health risks caused by smoking, which can have negative effects on the human body from head to toe. Smoking has long since been linked to lung cancer, emphysema and other cancers of the head and neck, but the leading cause of death among smokers in the United States is heart disease. Smoking damages the arteries of the heart, weakens the arteries, increases blood pressure and raises the risk of heart attack. In recent years, many residential alcohol and drug rehab centers have become non-smoking — like most other healthcare facilities — forcing alcoholics seeking treatment to quit drinking and smoking at the same time. Although there is research that found those who try to quit both at the same time do not remain sober as long as those who quit drinking only, there is conflicting research that indicates quitting both simultaneously can be more effective. The health risks are increased for all smokers, but recovering alcoholics are even more susceptible to the dangers of smoking because of the damage done to their bodies during years of heavy drinking. This is particularly true for developing cancer and cardiovascular disease. There are even more dangers for recovering alcoholics who continue to smoke. Many chronic, long-term drinkers experience some form of brain damage as a result of years of alcohol abuse. When they stop drinking, however, some of that damage begins to reverse itself. Diet, age, exercise and genetic make-up are all factors in how quickly the brain will recover. Researchers have discovered that the brains of recovering alcoholics who continue to smoke tobacco are much slower to recover if they recover at all. But there is another reason that recovering alcoholics, in particular, should try to stop smoking: some studies found that the continued use of nicotine can actually increase the craving for alcohol, and scientists believe it's because alcohol and nicotine act through the same reward system in the brain. Recent research has found that those who try to quit drinking but continue to smoke tobacco, have a more difficult time remaining sober because of these cravings, compared to those who never smoked, or those who quit drinking and smoking at the same time. Continuing to smoke can also cause some perplexing issues for those who found recovery through a spiritual program, such as AlcoholicS Anonymous. Can they truly claim a spiritual awakening, as the 12 steps suggest, if they are still harboring an active addiction in their lives — especially one as dangerous as nicotine? In 1935, nicotine addiction may not have been considered a "serious ailment," and continuing to use tobacco was considered less of a risk than continuing to drink, for the alcoholic. But today we know nicotine addiction can be, and often is, fatal. Betty Ford Institute Consensus Panel. "What is recovery? A working definition from the Betty Ford Institute" Journal of Substance Abuse Treatment. 20 September 2007. Mon, A., et al "The Impact of Chronic Cigarette Smoking on Recovery From Cortical Gray Matter Perfusion Deficits in Alcohol Dependence: Longitudinal Arterial Spin Labeling MRI," Alcoholism: Clinical & Experimental Research August 2009. National Institute on Alcohol Abuse and Alcoholism. "Alcohol and Nicotine." Alcohol Alert No. 71 January 2007.